Tony Greenstein's Blog: Are anti-Semitic attacks at a record high or is it the Israel lobby up to their old tricks? Are anti-Semitic attacks at a record high or is it the Israel lobby up to their old tricks? Below is a guest post by Alan Maddison on what I've termed the fake anti-Semitism campaign. In the Labour Party the Zionist/pro-Israel lobby has deliberately manufactured a media consensus that there is anti-Semitism in order that those who oppose Israeli Apartheid can be smeared with the label anti-Semitism. All the figures and statistics show that anti-Semitism is and we should be grateful that it is, at a historically low level. The Media reports “Anti-Semitic attacks at a record high” – but what does this really mean for British Jews? Such media articles and statements must be very worrying for British Jews to read, especially given the rise of Far Right neo-Nazi movements and Islamist terrorism, the main perpetrators of anti-Semitic attacks in the UK. Whilst not wishing to under-play the real threats to British Jews, I think it might reassure them to give broader context to these rather ‘anxiogenic’ articles, and to tell them their home is here in the UK and they should stay. Are British Jews now especially at risk for hate crime attacks in the UK? 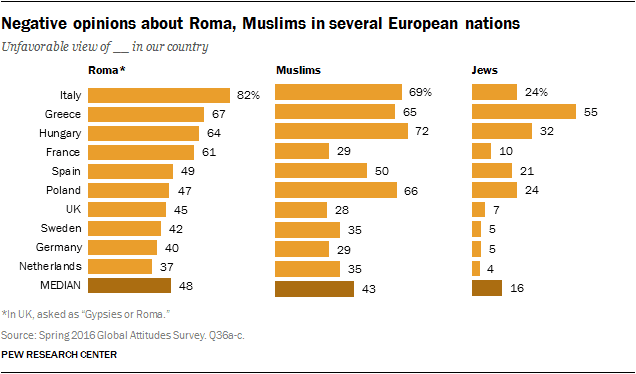 Surveys (Pew Research, YouGov) indicate prejudice against Jews does exist, but seems to be restricted to a small minority of people (7-8%), with the majority of UK citizens appreciating their Jewish neighbours and the contribution they have made to our society. 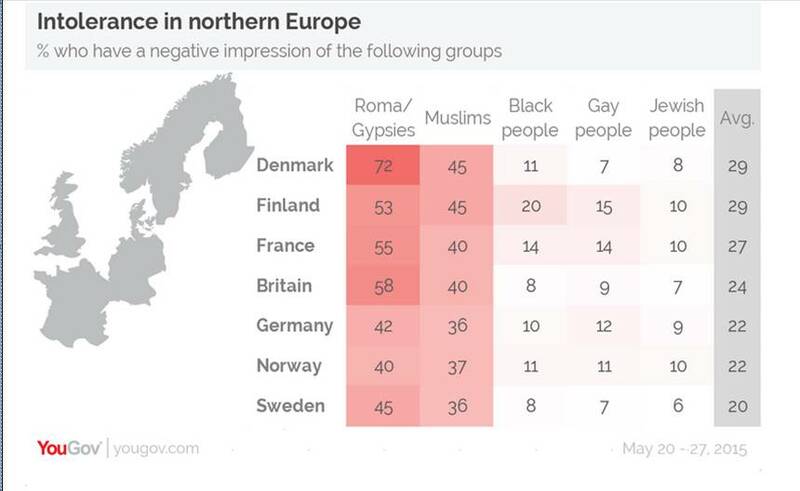 Up to 6-8 times more prejudice was recorded against Muslims and Roma Gypsies respectively than for Jews. Of course prejudice, though deplorable, is not hatred, and rarely leads to a hate crime offence. The police have not yet released data to March 2017, but their latest figures for reported hate crimes for the 12 months to March 2016 in England and Wales are shown below, together with CST data for anti-Semitic incidents. The 924 anti-Semitic incidents published by the CST represented around 1.5% of the 62 518 reported hate crimes. This is illustrated above with estimates of the breakdown for other victim groups for comparison. It is true that 1.5% seems a low share for anti-Semitism, but the Jewish population is only around 267,000, compared, for instance, with an Asian population of 4.37 million. To appreciate the relative risk for British Jews becoming a victim of a hate crime we need to look at the pro-rata data and these are shown below per 100 000 of each victim population. For an anti-Semitic incident the relative risk is slightly less than for a racist attack for all forms of hate crime offences, but higher than for other groups. What seems surprising in the above illustration is that violent assaults (with or without injury) represented about 30-40% for most victim groups, yet only 8% of those anti-Semitic incidents reported by the CST. So an Asian or Black person probably has a relative risk of a Hate Crime assault four times greater than a Jewish person. In addition, over a quarter of hate crime assaults reported to the police involved injury, for anti-Semitism the CST reported only 4.6% for this period, at least using GBH as a criterion. It is possible that, given these assault data, attacks on British Jews may be less frequent and less violent than those on Asian or Black people. Another explanation is that the CST has succeeded in its mission to encourage reporting of the less serious incidents, those incidents less likely to motivate victims to report to the police. The CST also seems to have greater resources than other victim groups to identify social media abuse. This could mean that by reporting such less severe forms of abuse, the 924 anti-Semitic incidents reported by the CST are “inflated” in relation to police reports for other hate crimes by a factor of around four. From both prejudice and hate crime data, it does seem that British Jews are NOT at greater risk, indeed BAME victim populations are four times more likely to be assaulted. Are the CAA allegations of “Police and CPS betrayal” justified? Gideon Falter, chairman of the CAA, reviewed recent information from their own records and other sources. He reported that according to his data compilation, 1078 anti-Semitic offences registered in 2016, but there were only 89 charges (8.3%) and 15 prosecutions. The Crown Prosecution Service (CPS) responded to this accusation by saying it was wrong to claim it does not take anti-Semitic crime seriously, “ Last year we prosecuted more hate crimes than ever before – more than 15 000 cases.” The CPS said they did not recognise the statistics contained in the CAA report. In fact, records show that the CPS did indeed prosecute 15 442 out of a total of those 62 518 hate crime cases reported over 12 months to March 2016, as they say, a prosecution rate of 24.7%. Police also report the breakdown for prosecutions and convictions for the main strands (motivations) of Hate Crimes as shown below. As police do not report national figures for further sub-groups within each strand, such as those motivated by Islamophobia or anti-Semitism, I have inserted the CAA anti-Semitism data for the full year of 2016 in italics. The average total hate crime prosecution rate (24.7%) is three times more than that which the CAA claims for the anti-Semitic hate crimes (8.3%), based on their own data. In addition, the CAA estimate of conviction rate for anti-Semitic hate crimes (16.8%) is very low compared with the 83% average. These “betrayal” allegations from Mr Falter are very serious indeed, and must be worrying for British Jews, and other citizens who expect the police and CPS to do their job effectively and without bias. It seems unlikely that over 40 police forces and the CPS would deliberately discriminate against British Jewish victims of hate crimes. Indeed most reports of any prejudice involved the past treatment of BAME individuals who make up most of the hate crime motivated by the Race category. This now has a prosecution rate of 25% and a high conviction rate. The CPS says they do not recognise the CAA figures, so it could be simply that the Mr Falter’s allegations are based upon unreliable data. 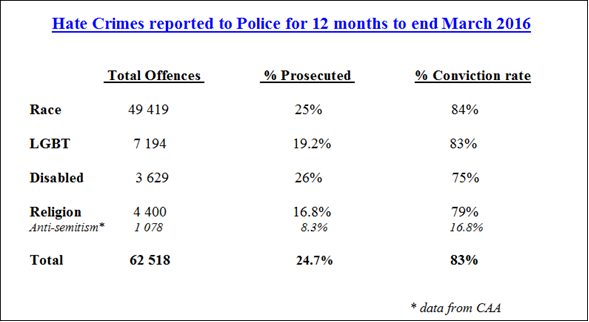 However, the CST did report only 22 successful prosecutions out of 1 309 for 2016, this represents 1.7% which is very low compared with the 20.5% conviction rate for total hate crimes reported to the police. In the absence of more detailed police data it seems likely that the prosecution and conviction rates of anti-Semitic incidents are low. So how do we explain this? The police record that in general the main reasons for failure to prosecute involve evidential difficulties (26%) and no suspect being identified (48%). Reporting an offence as a hate crime requires no evidence of motivation, just a claimed perception of the victim. But charges and prosecution DO need convincing evidence to be provided. Why should this be more of a problem for alleged anti-Semitic offences? Well there are three possible reasons besides police and CPS “ betrayal”. 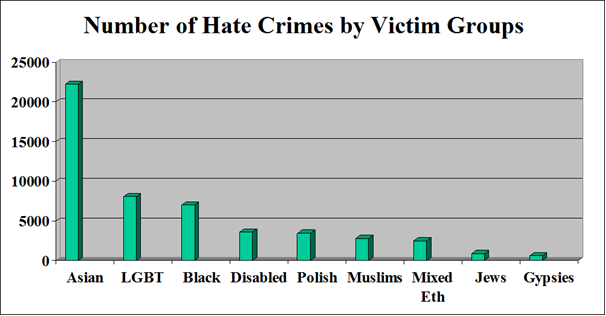 Firstly most hate crimes are reported directly to the police by the victim. But for anti-Semitic offences, many are passed on by the CST who in their recent report says only 38% come from the victim. In fact, the CST accepts anonymous reporting too. These processes would certainly make it harder for police to gather adequate prosecution evidence. Secondly, the CST encourages reporting of less serious offences which is evidenced by the fact that only 8-10% of their incidents involve assault, yet for all hate crime victim group strands this is around 33%. In one London Met Police report they stated that, “non-violent offences present less evidential opportunities.” It is therefore probably harder for police to gather adequate evidence for more minor incidents such as graffiti or social media abuse. The fact that there were four times more violent assaults reported for other hate crime victims than Jewish victims could explain why their prosecution rate is three times that for anti-Semitic incidents. Thirdly, the CST seems to use the IHEA definition of anti-Semitism and says they encourage the CPS to prosecute anti-Zionist or anti-Israel comments used in an accusatory or abusive manner. The validity of this has been challenged from a legal perspective. It is still lawful to voice legitimate criticism of the Zionist movement policies and those of the Israeli Government. Such freedom of speech may contribute to lower prosecution/conviction rates for anti-Semitic incidents. It therefore seems that Mr Falter is NOT justified in his public accusations of “Police and CPS betrayal of British Jews”. We need to place anti-Semitic attacks in a broader perspective. Not all assaults are a result of hate crimes. In fact the general population was exposed, over the same period, to 745 528 general assaults (402 316 of them inflicting injury). Of these assaults only 21 950 (2.2%) were reported as a Hate Crime. Below we illustrate the calculation of relative risk of being a victim of a general assault, or an assault motivated by either racism or anti-Semitism for each victim group. These figures are based upon Police and CST reports for 2016 and estimates of population sizes, largely from census data. Based upon data from England and Wales above, each year all British residents share an average risk of 13.5/1000 for being the victim of a reported assault. This is 34 times greater than the risk of a British Jew being the victim to an anti-Semitic assault (0.4/ 1000). We have also illustrated above, as seen earlier, that the Jewish community is exposed to only one quarter the risk for hate crime assaults compared with the predominantly BAME community. In other words, if according to Mr Falter, British Jews ‘endure intolerable levels of hate crime”, how must the BAME, EU immigrant and other communities at risk for racist attacks feel when their individual risk for assault is four times greater? What about the rest of us? Should we all emigrate when we carry a pro rata assault risk 34 times that of a Jewish person for an anti-Semitic assault, and an even higher risk of injury? In fact, based on CST assault data, a Jewish person also shares with the rest of us, a 34 times greater probability of being the victim a general assault than they do for one motivated by anti-Semitism. 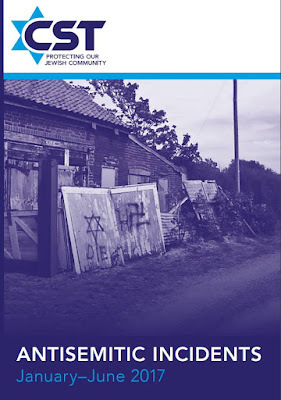 I have attempted to provide a broader perspective for the relative risks regarding anti-Semitic attacks for British Jews, and alternative explanations for apparently low prosecution and conviction rates. The allegations and remarks of Mr Falter do not seem justified. He has not presented convincing evidence that the police and CPS have betrayed British Jews. He is no stranger to unfounded claims such as these. Under his chairmanship, the CAA has devoted much of its time to attacking Jeremy Corbyn and the Labour Party with claims of rampant anti-Semitism. Yet in the Home Affairs Select Committee report into anti-Semitism (October 2016) they state that there is no evidence to support this. Such alarmist and unjustified accusations against important British institutions, like the Police, CPS and main Opposition Party, are divisive and undermine the genuine fight against anti-Semitism. We should remember that every week, in addition to TWO anti-Semitic assault cases, the police and CPS have to deal with 14 000 criminal assaults including over 8 000 with injury. Police resources are being cut, so it is understandable that some less serious offences, especially with poor evidence, may receive a lower priority, whether these are related to anti-Semitism or not. In addition, the evidence does not support the idea that British Jews should emigrate to avoid “enduring intolerable levels of hate crime” because the individual hate crime risk for them is relatively low, and more importantly probably 34 times lower than for a general assault. This is not to deny that hate crimes, however infrequent, are dreadful and lead to fear and anxiety of becoming a future victim oneself, or having a member of one’s family attacked. No British Jew, nor anyone indeed, should have to live in such fear. The rise of the Far Right neo Nazis in the USA may embolden those in the UK too. But we must fight anti-Semitism together, unrelentingly, using education, prevention measures and the application of the law. British Jews have excellent public, political and media support and should have confidence that the police and CPS are doing a good job on their behalf. The vast majority of British people, including myself, appreciate our Jewish neighbours and want them to stay in the country we have shared as our home, often for generations. The fight against ant-Semitism, Racism and all hate crimes, especially at this worrying time, requires bringing our communities together, not frightening British Jews to emigrate to Israel.